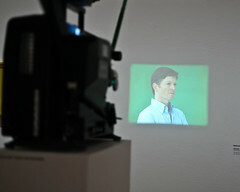 Untitled is an experimental film made by Los Angeles-based Israeli photographer Elad Lassry in 2009. 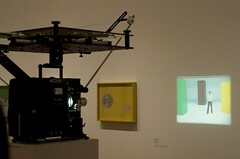 Between September 2010 and January 2011, it was part of the New Photography 2010 exhibition at MoMA. Mr. Lassry’s intensely vivid photographs are also related to the magazine page — they’re all about the size of a newsweekly — though their contents have more to do with the movie industry than with publishing. An Israeli-born transplant to Los Angeles, he studied film at CalArts before receiving his M.F.A. from the University of Southern California, and his aesthetic is best described as vintage Hollywood with a touch of John Baldessari. He makes abundant use of monochrome backgrounds, often in blues and greens that evoke the green screens of pre-CGI special-effects technology. His short untitled film, in which the actor Eric Stoltz directs a dancer held aloft by wires, is a stylized homage to the cinematic craft of movies. Mr. Lassry also appropriates photographs from film archives, sometimes cropping them and sometimes just representing them in gilded frames. Lassry often places his photographs beside 16-mm film projections. Untitled (2009), featuring Eric Stoltz in the role of choreographer teaching steps to a dancer dressed in red bodysuit, heightens the tension between stillness within the moving image and the temporality of the static image. A deft explorer of the relationship between image and picture, Lassry perks up the seductive language of film and advertising with a touch of subversive conceptualism. Lassry often displays his photographs beside 16mm film projections. The presence of Untitled (2009), a film featuring actor Eric Stoltz as a choreographer teaching a dance routine to a performer in a red bodysuit, provokes tension between the overall impression of a film strip and cinematic temporality.